I was sitting at the kitchen counter one day, staring at the valance over my window. I’m ready for something new. I get this from my mother who changed curtains in the kitchen to match every holiday and season. In the fall, we had leaves, after Thanksgiving, holly and berries, in the spring, the lovely florals went up…you get the picture. I don’t have cafe curtains, though I have thought about them. But sitting there, staring away, I had an idea. 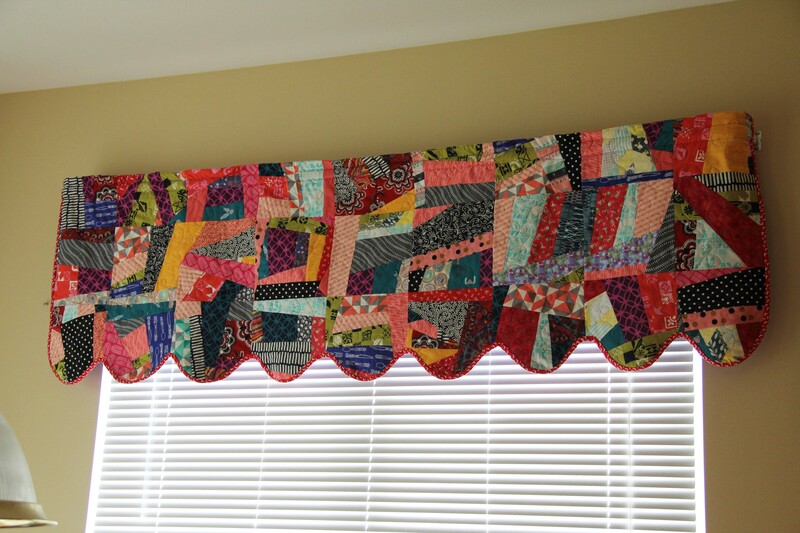 What about a quilted valance? 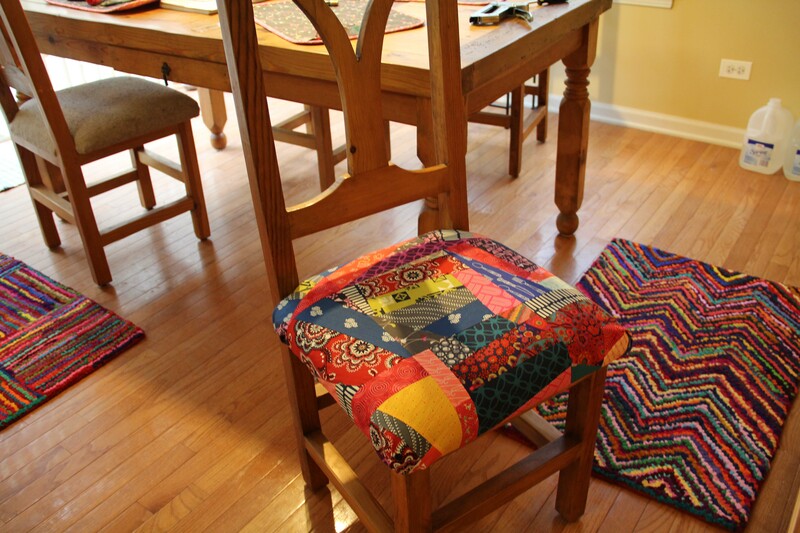 Better yet, what if I made matching seat covers for the chairs? Suddenly I was excited about a project. All I wanted was colorful and different. So that’s what I made. The valance is made of crazy quilt blocks, 8 1/2 inches unfinished. 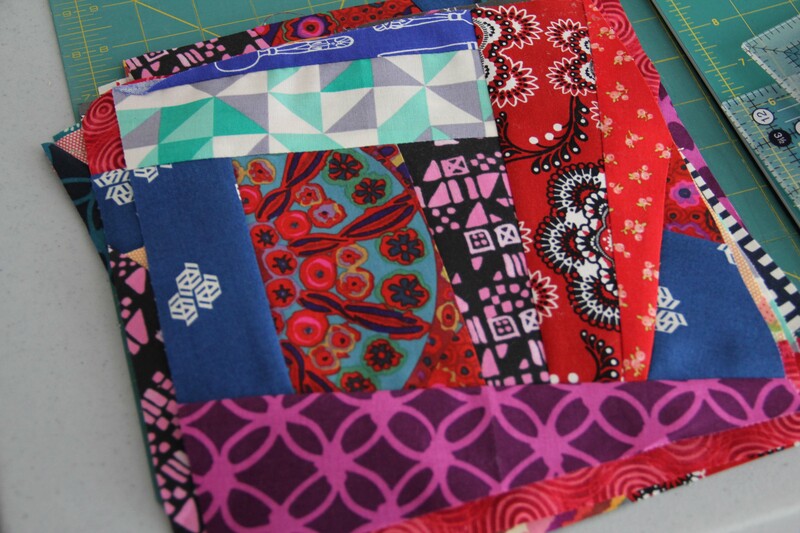 I grabbed all sorts of scraps I had lying around…some were from fatquarter bundles, some random, some leftovers from other projects and just began sewing. The beauty of this project is that it doesn’t take any real focus or concentration. 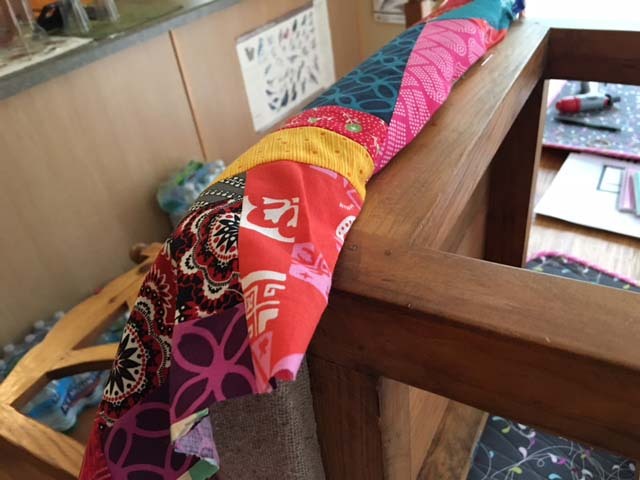 The 1/4 inch seam doesn’t have to be perfect.The colors can be anything you want…no matchy-matchy stuff. 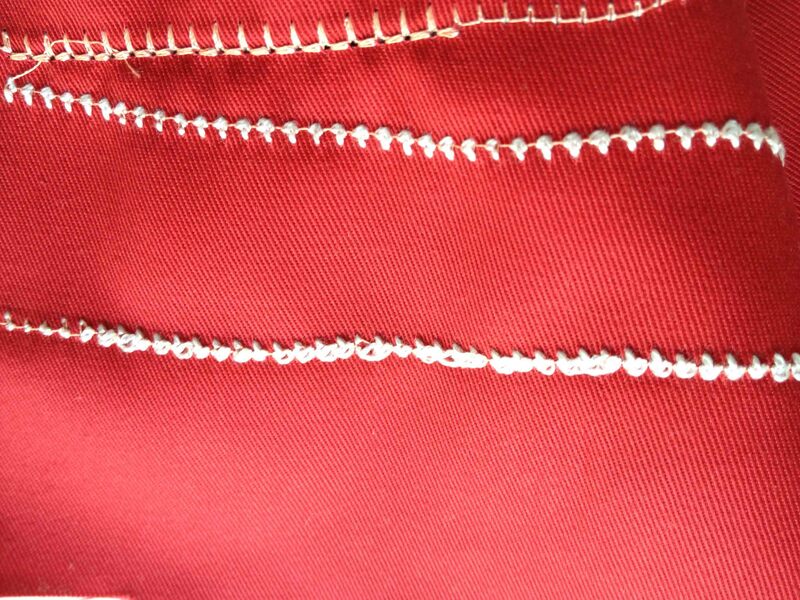 Just square it up to 8 1/2 inches, then sew them together. And the result is happy crazy. 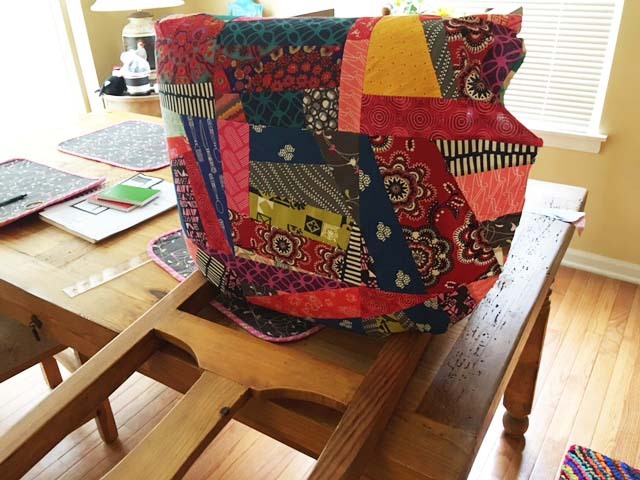 For this valance, I assembled 3 rows of blocks, measured the window and the rod, and created a quilt sandwich and quilted the whole thing. Then I came back and added the scallops and bias binding. From the top, I just folded it down enough to form a rod pocket and sewed it in place with a couple of straight seams. The binding goes all the way around, it’s just turned down at the top so you don”t see it. 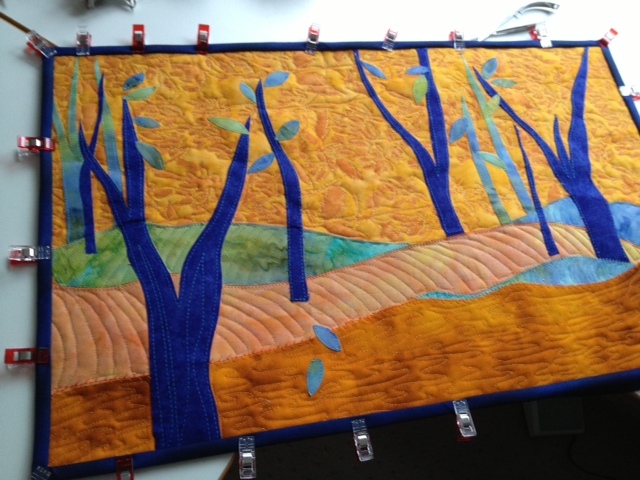 And because the quilt is heavier than plain fabric, even with a lining, it hangs nice and flat. I love it. It’s exactly what I wanted. Then I turned to the chairs. Anyway, I started in the back and pulled the fabric to the front, using a staple gun. 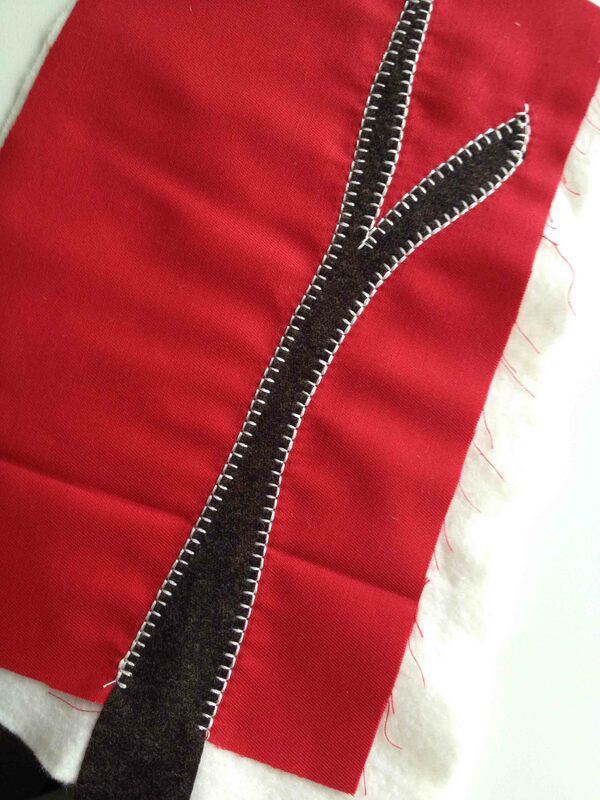 I did allow myself enough fabric to double the seam where it’s stapled…I didn’t want the fabric to fray and unravel. Just pull taut from the back to the front and staple it down. It doesn’t look very taut in this picture, because my hands were on the camera, but when you are working, you really need to pull tight, with one hand and staple with the other. I am loving how this turned out. I know it won’t last forever, but now that I’ve changed the covers once, I can do it any time. 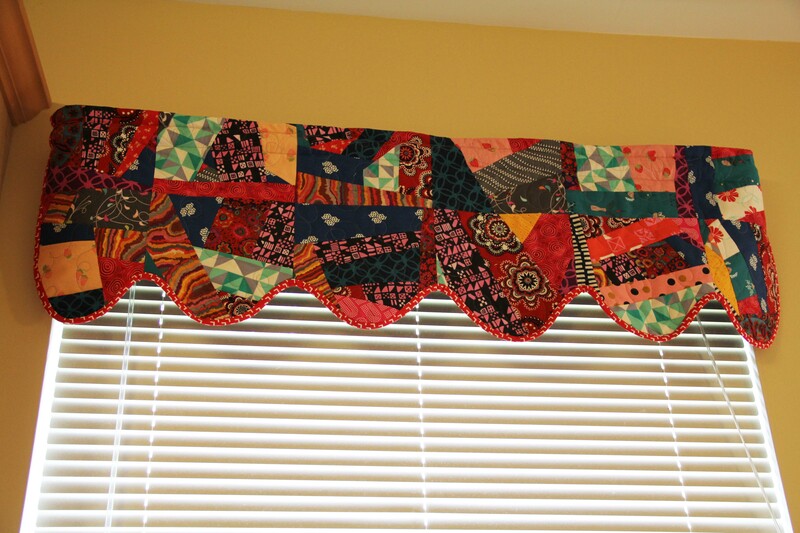 Finally, I made another little valance to go over the sink, which is a smaller window. Same process, fewer blocks. This was fun stuff. 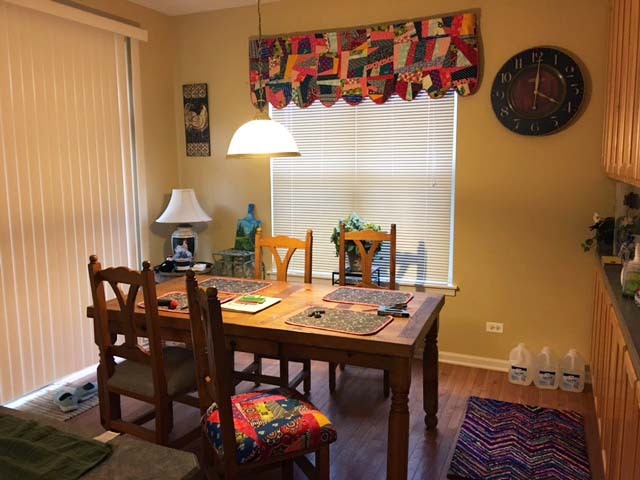 If you can make a quilt, you can make these valances and chair covers. It’s just taking the same principles and adjusting to different shapes. I’m getting ready to start working on the polka dot project. I have an idea about creating a tree with the different polka dots as the leaves. I am starting as a base fabric some absolutely lovely twill which I ran across on rosie.com, which had an advertising link to Honey Be Good. Honey Be Good sells premium organic cotton. 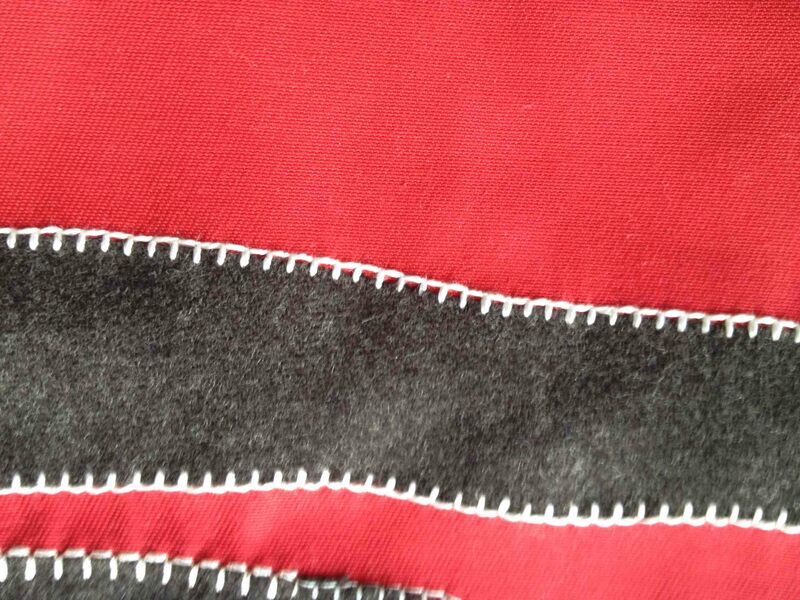 I’ve only purchased this red twill there so far, but wow, the twill is yummy. I need some clothes made out of this stuff. I’ll be adding wool as the trunk of the tree, and I wanted to outline it in white. I’m never sure how it will all turn out, but that’s the thought right now. So I experimented on the machine using white perle cotton, size 8, as the blanket stitch thread. As you can see, the perle has a lot of dimension, jumps off the fabric and generally adds a lot of pop. But size 8 is just too large to go through the tension disks properly. I used a 90/14 needle and reduced the tension somewhat. But you can see that the back side was looking like it might get knotted and nested at any moment. Considering the size of this project, I just don’t want to be worrying so much about the thread. I switched to Aurifil, size 28, and used the triple blanket stitch. I made the blanket stitch a little wider for visibility, since the thread is so much finer. Aside from having a more “machine-stitched” look, it does the job with the same “eyeball impact”. So here’s where I’m eventually headed. 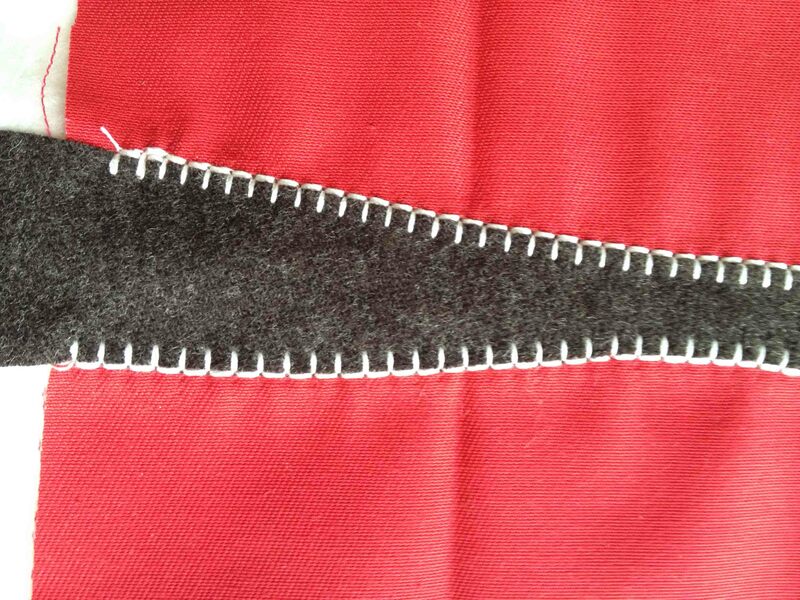 I will be using much larger pieces of wool on the twill, with the white blanket stitch around it. Eventually the whole project will be machine quilted, but not until I get all the details that I want. I urge you to really experiment with your machine and some of the thicker threads. You can get a hand-stitched look, and even when it does not look quite as hand-stitched, you can certainly add texture, dimension and detail to your project. Be bold. Nobody is writing the rules. –Patterns can be perfect. Patterns can be imperfect. It’s not always easy to get into the head of the designer. –The Teflon foot is great on vinyl-covered fabric. Regular feet work even better as long as I’m working with right sides together. A big hangup at that point is the vinyl-covered seam allowance running against the bottom of the machine. It sticks. Wishing someone would invent a teflon stitch plate. –The zipper foot with dual feed is almost as good as it gets for attaching piping. –Don’t rush. It’s miserable to backtrack. It’s looking more like it might actually become a coat. 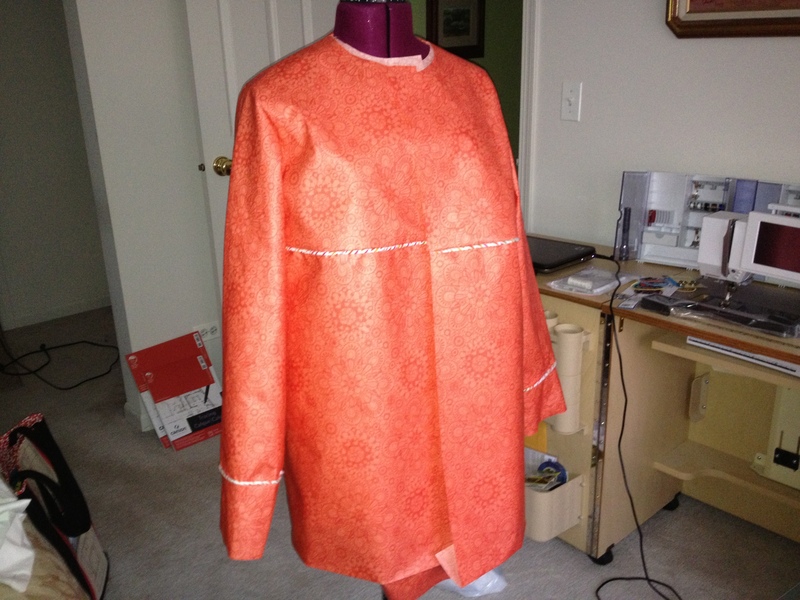 All that’s left is to attach the hood, sew the lining and coat together, then finish up the hems and topstitching. Still a lot of work but I am seeing the light at the end of the tunnel. Just as anticipated, the answer to the sleeve dilemma appeared when I least expected it…in the form of a petite white-haired woman who walked into the store. We chatted for awhile, and I invited her to join some other customers in having a little cookie treat in the back classroom. I sat down with a cookie myself, and almost thinking aloud, I mentioned the “speed bump” I had run into using vinyl-covered fabric. It’s actually a dream to work with. It sews and folds and presses just fine (with a pressing cloth). But vinyl-covered fabric doesn’t have a lot of “give”. 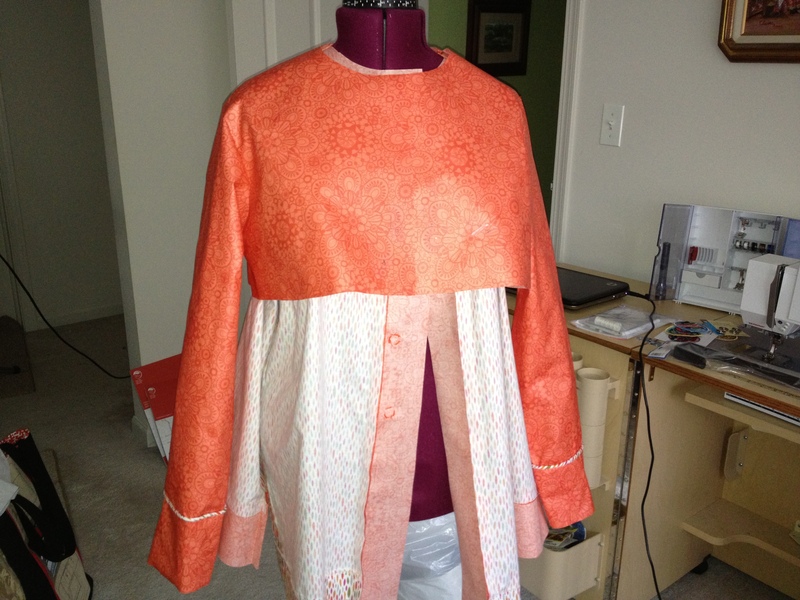 When setting the sleeves on the muslin and on the lining, I had no trouble because I could ease the fabric. Not so with this. So I ended up with two sleeves that appeared to be too big for the armhole. I looked at her, disassembling and reassembling the coat in my mind. It was an obvious solution – and I never would have thought of it. “That just might work…” I said slowly. “Mmm-Hmmm,” she said, taking another bite of cookie. “I used to do a lot of garment sewing, and you know, you can forget about pattern instructions.” She waved her hand dismissively, with a twinkle in her eye. The next day I went back to work on the project, and tried what she suggested. Voila! Two (almost) perfectly set sleeves. Onward to the next set of challenges. And a special shout out to all the women who help other women every day. You make the rockin’ world go ’round!